This story was updated at 10 p.m. ET. An old NASA satellite fiery death plunge back to Earth tonight (Sept. 23) may be visible to some lucky skywatchers in Southern California, weather permitting, according to the latest prediction from a nonprofit space industry firm. 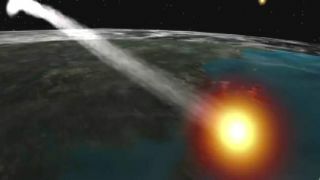 The 20-year-old spacecraft, called the Upper Atmosphere Research Satellite, could create a spectacular fireball over Southern California that would be visible between 7:40 p.m. and 7:50 p.m. PDT, according to the El Segundo-based Aerospace Corporation. If the UARS satellite's fiery fall is visible, will pass from the southwest to the northeast of the southern sky, Aerospace officials said. The potential for falling debris "poses little risk to human life and property," they added. NASA estimates that about 26 large pieces of the UARS satellite will survive the scorching hot temperatures of re-entry and reach the ground. But the chances of the debris posing an injury risk to people on the ground are extremely remote, NASA officials have said. Earlier today, the Federal Aviation Administration issued a space debris alert to pilots warning them to be on the lookout for any falling UARS satellite pieces. Any sightings were to be reported to FAA officials, the alert stated. NASA has repeatedly warned the public not to touch any UARS satellite debris if the spacecraft falls over a populated region. All debris sightings should be reported to local law enforcement authorities, NASA officials said. The $750 million UARS satellite mission was launched into orbit aboard NASA's space shuttle Discovery in 1991. The satellite spent 14 years studying Earth's ozone layer and upper atmosphere, and was shut down in 2005.